Form 26AS is the important document issued by the IT department to the taxpayers. I have noticed that the majority of taxpayers are not aware of Form 26AS and its importance. In order to spread awareness about Form 26AS I am here with detail information about Form 26AS and its importance. Form 26S is consolidated annual tax statement issued to the income tax payer by the IT department every year. 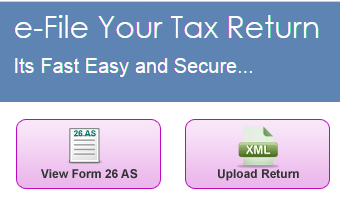 You can download Form 26AS from Income tax filing website. Form 26AS shows how much tax is credited on your account from various sources like salary, pension, interest income etc. Apart from this Form 26AS contains following information. Why it is Important to check form 26AS before filing Income Tax return? You should cross check detail mentioned in form 26AS against TDS certificate. i.e Form 16 or Form 16AS before filing income tax return. This is to ensure that the TDS deducted on behalf of the taxpayer by deductor is actually deposited with the income tax department. E.g If you are a salaried person and your employer has deducted Rs 50,000 and you have also paid the advance tax of Rs 10,000, form 26AS should reflect these details. If your 26AS is not showing this detail and you are filing a income tax return without checking 26AS it will be misleading information in Income tax return and you may receive demand notice. How 26AS form is useful to you? This form serves as an authentic reference document for TDS, TCS, Advance tax and refund details. You can confirm your income/earning using this form. This form can be used to know exact refund details. This form contains detail information like BSR code, amount deposited, date of deposit, TAN number etc. You can use this form to file your return in case your form 16 is misplaced or lost. To verify that the bank has credited tax deposited by you to the government. It is because of form 26AS only that we need not to attach form 16 or TDS certificate with income tax return form. What is the reason of mismatch in Form 26AS? Sometimes Form 26AS contain information that is not matching with TDS certificate. The reason of mismatch in form 26AS is given below. Non Filing of TDS Return – Dedcutor has not filed TDS return which will result in non mapping of TDS deducted with form 26AS. Wrong Information in TDS Return – Deductor have punched wrong information in TDS written like PAN number, Amount of TDS deducted, Amount of TDS deposited or Assessment Year. Omission of Information in TDS Return – Mismatch Due to clerical mistake done by the deductor towards omission of important information. What is to be done in case of mismatch in TDS and Form 26AS? In case you find a mismatch in TDS and form 26AS, you don’t have any option but to chase deductor of TDS (employer or bank) to correct the mistake. If the return is not filed you need to ask them to file TDS return. If the return is already filed you need to ask them to locate and correct the mistake. How to view/download Tax Credit Statement Form 26AS? You can view/download this form in 2 different ways. You will be redirected to TDS-CPC website. Select Assessment Year and view or download option and Form 26 AS will be shown to you. You can use Net banking facility of the bank to view your Form 26 AS. This facility is available if PAN number is mapped with the respective account. This facility is available for free. Only authorized banks like SBI, ICICI, Axis Bank, Bank of Baroda, UCO Bank etc. are providing this facility. Check your form 26 AS before filing your income tax return. I have seen that many taxpayers are receiving demand notice asking them to pay tax although they have already paid taxes. So please verify your form 26AS against your TDS statement. Do share this information with your friends on facebook. As mentioned in conclusion what to do when such demand notice is received from CPC? Dear Nirmalkumar, You need to pay tax mention in demand notice or if you have already paid tax you need to respond to notice by attaching proof of TDS. First find out why this detail is not reflecting in 26AS.